The Hillsborough, New Hampshire balloon festival occurs every year in July, near Concord NH. For further information, see http://www.balloonfestival.org/balloonhome.html. A balloon festival also occurs in Queechee, Vermont in June. One by one, the dozen balloons at the Hillsborough balloon festival prepared to ascend early Saturday evening. Eight liftoffs were planned for the festival but only 2-3 happened. 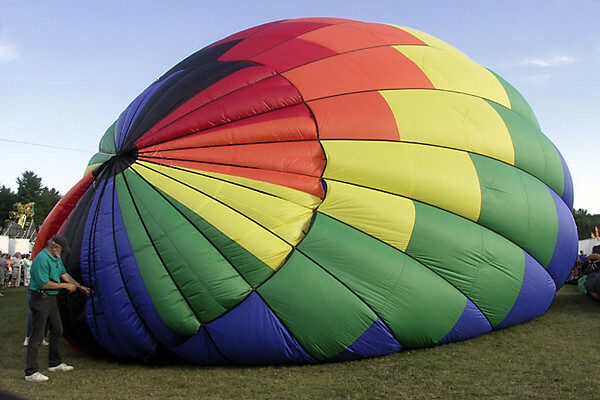 The wind must be under 10mph because balloons are dependent upon the wind, and unable to steer. They can only control ascent and descent.